Is backflushing important with the GravityWorks filter? Yes. You must backflush regularly to maintain optimal performance of the filter cartridge. We recommend backflushing anywhere from every 8 liters to after each use, depending on water quality. The more you backflush, the better your flow performance and the longer life you can expect from your filter cartridge. The easiest way we have found is to do it every time you fill your Clean reservoir (see the video). Once you have used your GravityWorks filter and wet the Hollow Fiber filter media, the fibers will remain wet for a very long time. Therefore, it is important to prevent it from freezing, which can permanently damage the filter media. If you are traveling in areas where you are expecting freezing or near freezing temperatures, bring the filter into your tent, or even your sleeping bag. 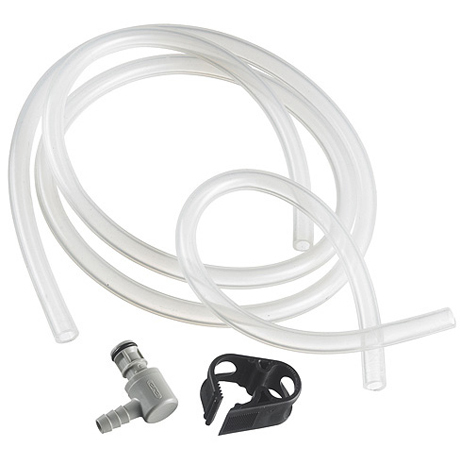 The included, watertight hose barb covers will prevent any leakage wherever you store it. If you think your filter may have been damaged by freezing, perform a Filter Test before the next use. What if the filter takes a hard drop? The casing of the GravityWorks filter is designed to protect the Filter Cartridge from most drops, but direct drops onto cement and any drops above 4 feet (1.2m) should be avoided. If the Filter Cartridge itself is ever dropped after being wetted and outside the protective housing, you should replace it. (We don’t recommend removing the Filter Cartridge from the protective housing except to replace the Filter Cartridge.) If you think your filter may have been damaged from a drop, perform a Filter Test before the next use. What’s the easiest way to get the water out of my GravityWorks filter once I’ve filtered? The GravityWorks filter turns into an amazingly handy delivery system by simply closing the black hose clamp, disconnecting the Clean reservoir and tubing from the filter cartridge and hanging somewhere accessible. Then simply use the hose clamp as your on/off switch and you basically have a faucet right in camp. For faster flow, simply remove the cap and pour.